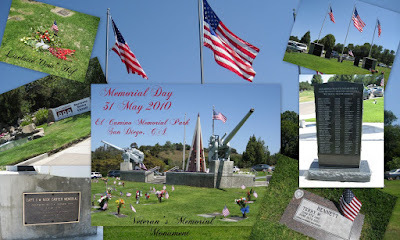 The photos in the above collage were taken today the 31st of May 2010 at the El Camino Memorial Park where my Oma was recently buried (26 May 2010). Unfortunately, we know too many who are buried there. Terry Bennett, my husbands partner on the SDPD (lower right photo), who was killed while on duty on the 26th of June 2003. Our beloved brother-in-law, Keith Tiffany, who was also killed while on duty (SDPD) in 1981. Photo right and center, bares the names of our fallen officers, Terry's was the last to be etched on that stone. Visited Oma's gravesite (upper left hand corner). Our family is remembering on this day, the many we have lost as they served our country to keep our freedom alive...our fellow police officers we have lost while they were serving to protect us. You will always be in our hearts. Gini, what a beautiful tribute! Having known two SDPD officers killed while on duty is terribly tragic. I drove by the cemetery many times and later found out that an aunt is interred there. Catching up on reading. I really enjoyed the tribute.